The Arab Scout Region (الاقليم الكشفي العربي) is the divisional office of the World Scout Bureau of the World Organization of the Scout Movement, headquartered in Cairo, Egypt. By 1954, Scouting had become so popular in Arab countries that WOSM established the Arab Scout Region in Damascus, Syria. 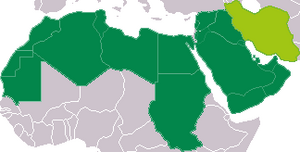 The Region comprises 17 members of Scouting in Western Asia and North Africa, including Algeria, Bahrain, Egypt, Jordan, Kuwait, Lebanon, Libya, Mauritania, Morocco, Oman, Palestine, Qatar, Saudi Arabia, Sudan, Tunisia, the United Arab Emirates, and Yemen. Although Iraq and Syria are at present not WOSM recognized nations, both have Scouting movements and are among the first founders of the Scout Movement in the Arab Region. Scouting is also being developed in Western Sahara with the assistance of Scouts from the Canary Islands. This region is the counterpart of the Arab Region of the World Association of Girl Guides and Girl Scouts (WAGGGS). In 2006, Dr. Atif Abdelmageed Abdelrahman Ahmed of Sudan was named Director of the Arab Region. Once nascent Scouting receives WOSM recognition, the Arab Scout Region may also be inclusive of Iran, an ethnic outlier not strictly part of the Arab sphere, but often included in the region due to cultural and religious ties. However, despite that logic, Pakistan is a member of the Asia-Pacific Region, and Turkey is a member of the European Region, so the final disposition of Scouting in Iran will be decided at that time. Somalia may also be a some-time member of the Region (see postal cover graphic). The map on the main page for the Region's official website indicates that Ethiopia, Eritrea, Djibouti, and Somalia are within the bounds of the region. Ethiopia is at present a member of the African Region, and the others are awaiting WOSM recognition and final geographic disposition. The Cairo International Scout Center is a lavish six-floor building next to Cairo International Stadium that welcomes all Scouts, nonScout organizations and individual guests. It hosts both conference areas and hostel quarters. This page was last edited on 15 March 2012, at 20:55.